A potential bull market in commodities, precious metals and miners could accelerate higher if Congress gives Obama the approval to attack Syria based on the use of chemical weapons of mass destruction against innocent civilians. Commodities, energy, gold and silver are safe havens that usually rise in value during international conflicts and war. Remember the major breakout in gold after September 11th in 2001 and the invasion of Iraq in 2003. The ramifications of increased involvement in the Middle East could have a major impact on global trade. The tensions with Russia is increasing as Putin supports Assad. 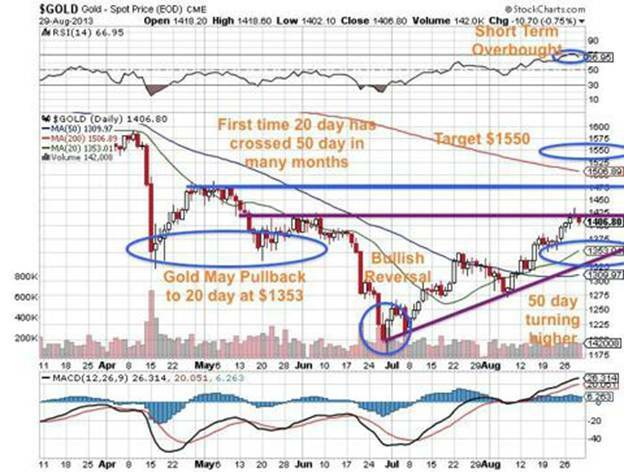 Just 8 weeks ago in late June, I alerted my readers to a major buy signal in gold (GLD), silver (SLV), junior mining stocks (GDXJ) and energy (XLE). I was absolutely amazed at the investor euphoria in equities at the time and the pessimism in precious metals and commodities and predicted correctly that the concern about War in The Middle East will spark a rally in oil, gold, silver and the miners. When no one was buying and in fact shorting precious metals and energy, I was one of the only writers who said at the time, "This instability in the Middle East and around the world means investors should look for assets that maintain value during chaotic times. Precious metals and energy could be one of the safest areas to hedge against rising Middle East turmoil." Now 8 weeks later gold has rallied $200, silver has gone up more than $6 and oil (DBO) is about to break through multi-year highs and could move to $150 a barrel. All over the headlines investors are scrambling for safe havens as the U.S. prepares to invade Syria. Don't forget Iran which may be advancing quickly towards having a nuclear weapon. We should remember that Assad is a proxy for Iran. The interest in safe havens particularly gold, silver and the miners are reaching short term overbought levels as investors flee to safety. 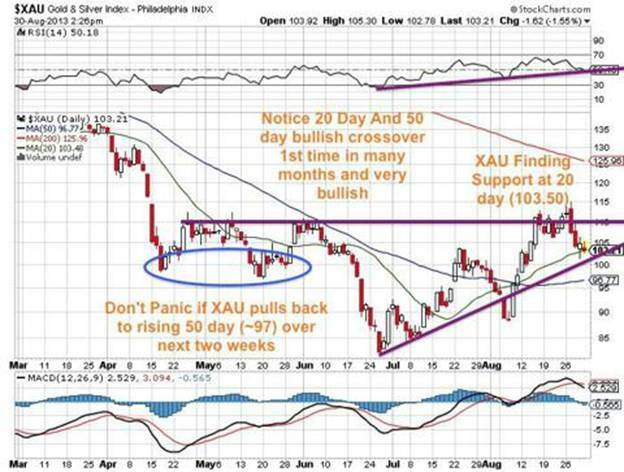 In the middle of the summer I wrote, "Do not be surprised to see gold and silver which are down over the past two years make a "V" shaped reversal shaking out all those who sold during this correction. Although I don't want chaos to happen, many savvy investors believe this possibility is growing, especially with oil now breaking $100. I believe now may be the best time to protect oneself with precious metals, energy and really cheap junior mining stocks." Now eight weeks later, all the talking heads who were saying to short gold two months ago are scrambling back in. The U.S. may launch an attack as Syria's Assad is now using chemical weapons. An attack on Syria could accelerate the move in gold, silver and energy, which may continue to rally just based on inflationary concerns alone. Short covering combined with new value investors looking to hedge with this sector has caused an explosive move. Some of the technical indicators are short term overbought so be prepared to use consolidations as buying opportunities. Housing numbers and economic indicators look weak and I expect the precious metals to surprise the market which may incorrectly predicting tapering from QE by the Fed in September. We may see a consolidation for a couple of weeks in precious metals and energy after rallying impressively before Labor Day, as investors wait for the Fed in the middle of September. Look for a consolidation in precious metals as a potential buying opportunity. Precious metals and the miners (GDX) may rally after this meeting as the market realizes the Fed may not be so motivated to start tapering in September and as the Middle East continues to flare up with conflict. Technically, gold is short term overbought and reaching resistance at $1425. A short term pullback to the 20 day ($1353) or 50 day (1310) which are now both rising and making a bullish crossover for the first time in many months, may be healthy and provide a secondary buy-point. The Gold and Silver Index ($XAU) has rallied close to 30 points since June and is entitled to a breather. Don't panic if the $XAU pulls back to the 50 day around 97. The 20 day has made a bullish golden crossover with the 50 day which is also beginning to slope higher. This is very bullish and could mean a rally to the 200 day at $126 after breaking resistance at $115. The XAU is forming a bullish ascending triangle pattern which could predict a potential breakout and long term bullish reversal. Silver is experiencing an explosive move of over $6 since the low in late June and is overbought so long term investors should look to add on healthy pullbacks to the 20 day ($22.16) or 50 day (20.63). 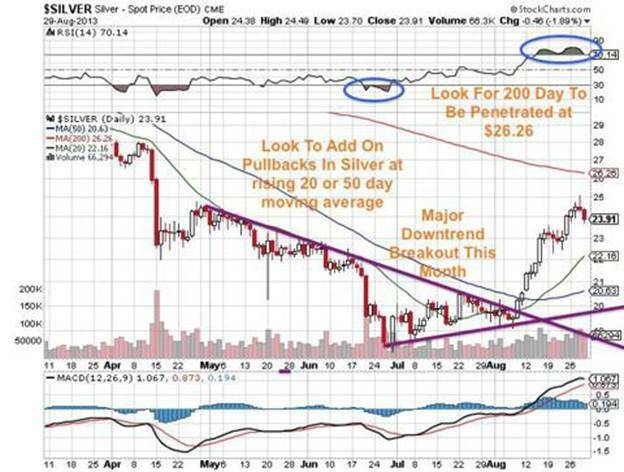 I believe the major two year downtrend was broken this past month in early August and possibly after a healthy pullback silver could rally past the 200 day at ($26.26). Silver is outperforming other commodities over this past three month rally. This may be a signal that we could once again see silver make a powerful move similar to 2010 when silver ran from $18 to around $50.